What was the seder table when we only had Elijah’s cup? Incomplete. Angry prophet of the world to come. To the fire from the sky that was Elijah’s gift. Who then saves the Jews! Elijah, the bringer of justice. We were slaves in Egypt and it was horrible. To have his cup of wine. So the kid thinks Elijah is there, taking a sip. Dancing prophet celebrating the world that is now. And teaches us to save ourselves. We were slaves in Egypt and now we are free. Making sure we have fun at the table. Make sure the kid respects Miriam, and values her water. The cup of water to quench it. Only with both cups are we complete. We are blessed this Pesaḥ night. Trisha Arlin’s prayer-poem for Pesaḥ, “Two Cups: Elijah and Miriam,” was first published online on her website, with a CC-BY-SA 3.0 Unported license. “סדר לפסח: שתי כוסות, לאליהו ומרים | Two Cups: Elijah and Miriam, by Trisha Arlin” is shared by Trisha Arlin with a Creative Commons Attribution-ShareAlike 4.0 International copyleft license. 2012-04-12 – 20 Nisan 5772 at 5:24 pm · Reply. [The cup of Miriam] is set to the table filled. At the end of the Maggid, after the recounting of the plagues (and of the splitting of the sea if the haggaddah contains it) we recount the Midrash in which Miriam’s well appears, and pass the cup around, adding a bit of its water to our glasses to represent sustenance from our tradition. 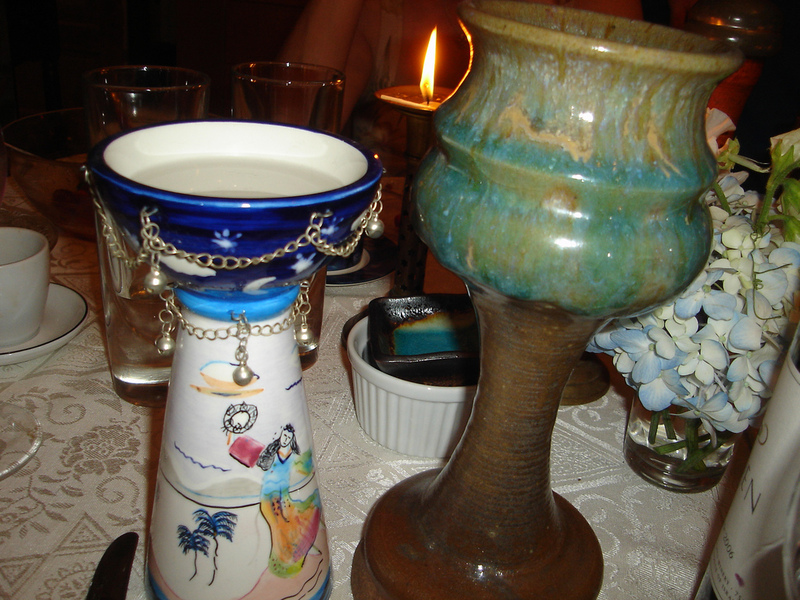 We will later, during the “redemption” bit of the Seder each add a bit of our wine to the Elijah’s cup that is sitting empty on the table, to represent that redemption is something in which we all have a role. 2014-03-13 – 11 Adar II 5774 at 7:53 am · Reply. Poetic license aside, the idea of a sixth cup attributed to Miriam is troubling (non-sensical?). There is a debate as to whether we should have four or five cups at the seder. The source for four cups is the rabbinic reading of the verses, Exodus 6:6-7 (jointly comprising one grammatical sentence), which contain four expressions of redemption or redemptive action that G-d will take. There is a fifth expression of redemption in the immediately subsequent verse, 6:8, hence the dispute between either 4 or 5 cups. Six is not an option. The four cups also correspond to four junctures in the haggaddah where one would make a blessing on wine: (1) the kiddush, (2) the beginning of the mean, (3) the end of birkat hamazon, and (4) the end of Hallel. As for the attribution of the doubtful fifth cup to the Prophet Elijah, the source for this is not clear. One explanation is that Elijah presides over bris milah (hence the custom to have an empty chair next to the baby at the bris ceremony) and all Jews required circumcision before they would be redeemed. Another explanation is that as we recall the prior redemption, we also invoke and look forward to the future redemption which will be heralded by Elijah. Miriam is not a character in the seder. Nor is Moshe for that matter–his name is not even mentioned in the Hagaddah (i.e., the entire story of the exodus is told without mentioning Moshe… pretty amazing). So, I’m not sure why we would put Miriam in a more prominent role than Moshe. Mrs. Arlin should check her sources. I’m not sure I appreciate the rest of the poem. It seems to include a lot of agnst, and possibly anger, which would not be a good emotional or intellectual approach for introducing children to Judaism at the seder. 2014-03-13 – 11 Adar II 5774 at 10:30 am · Reply. 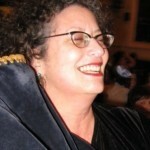 Miriam’s Cup originated in a Boston Rosh Ḥodesh group in the late 1980’s. Based on the Legend of Miriam’s Well, Stephanie Loo created a new ritual. A member of the group led a guided meditation during which women gained inspiration and renewal from the Mayim Ḥayyim (Living Waters) of Miriam’s well, and the group drank from a special vessel called Kos Miriam (The Cup of Miriam). Members of the group found the ritual so empowering that they adopted the idea of using Kos Miriam on Shabbat. The idea of using Kos Miriam at the Passover Seder was a natural progression because of Miriam’s central role in the Exodus story. Your point is well taken concerning the important absence of Moshe in the particular narrative offered in the traditional Pesaḥ Haggadah, and this absence would certainly apply to other charismatic figures present in the story of the journey out of Mitzrayim and through the Midbar. But to better understand this custom of including a cup of Miriam, it’s important to understand the yearning the custom gives expression to. It is also a way of drawing attention to the importance of Miriam and the other women of the Exodus story, women who have sometimes been overlooked but about whom our tradition says, “If it wasn’t for the righteousness of women of that generation we would not have been redeemed from Egypt” (Babylonian Talmud, Sotah 9b). The cup of Miriam itself represents not Miriam but the well provided to Bnei Yisrael in her merit to quench their thirst throughout their journey in the Midbar (Babylonian Talmud, Ta’anit 9a). This custom is certainly a ḥiddush, but inarguably, it’s an innovation which was made in the spirit of the mitzvah of Pesaḥ — to imagine oneself drawn out of Mitzrayim. The symbolism of the well and it’s deep association with the merit of Miryam and the Banot Yisrael, provides for a fascinating justification for those seeking to enrich the experience of the seder for themselves and their children . Certainly, it will inspire questions of adults and children alike, and what more can one ask for besides a joyous and kosher Passover journey? 2017-06-14 – 20 Sivan 5777 at 7:29 pm · Reply. The term “kos shel Eliyahu” is actually misleading. It is not for him to drink and not even in his honour. The reason Eliyahu got mixed into this is exactly because we don’t have an agreement on the 4 or 5 cups question. This situation is known as TEK”U, a term also used by modern Hebrew speakers for a tie in a game. A TEK”U is an acronym (or maybe a backronym) for Tishby will solve questions and problems, meaning that in the future, when Eliyahu (the Tishby) comes back to earth to announce the coming of Mashi’ach, he will also reveal the solution for those tied questions. I can see why one would want to add a female figure to the sedder etc., but the whole structure is built in midair on a strange Jewish parallel to St. Nick (wonder why Christians never gave him a female companion/alternative yet…).